When is it? 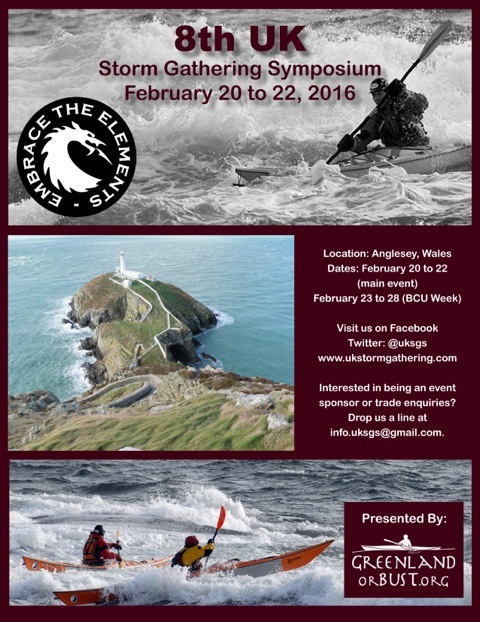 - The next UK Storm Gathering will run from February 20 to 22 on Anglesey, Wales in 2016. What's it all about? - The idea is to bring together like minded people not quite ready to hang up their paddles for the winter and to network with others looking to take their sea kayaking to another level. There will be challenge, adventures and fun. What's on offer? - The intention is to run a number of practical workshops and journeys covering the following themes – Safety, Skills and Seamanship. Each day will begin with the option of Yoga For Paddlers with Helen Wilson. Evening sessions will include social events with presentations from guest speakers. A number of retailers and manufacturers have been invited to allow for Q & A opportunities and demo boats. Who is it for? - Attendance is open to anyone with intermediate sea kayaking skills or above looking for the next challenge. The ability to wrestle a walrus and eat seaguls is not necessary. When to book? - We will begin taking bookings from September 2015 when the programme has been finalised. Please contact the organising team via info.uksgs@gmail.com - if you are in any questions, queries or concerns.